Anthony Martial has been linked with an exit away from Old Trafford this summer but if the club and Jose Mourinho know what is good for us, he should be held with both hands and persuaded to stay. At 22, what he needs is an arm around the shoulder. Jose Mourinho must know that his tough-love approach may not always work on modern footballers. With the Portuguese tactician interested in signing £60m-rated winger, Willian from Chelsea, United need to re-evaluate the pursuit of the Brazilian. Why go for Willian, 29, when we have a younger and arguably more skillful player in Martial? Though he may not yet be consistent, Martial has the potential to be one of the best. United had also been linked to the signing of Ivan Perisic from Inter Milan, but a move for the 30-year-old is also not being met with enthusiasm by the club hierarchy, who are not too sold on the idea of paying over the odds for a player that has maybe only 2 or 3 years left at the top of his game. 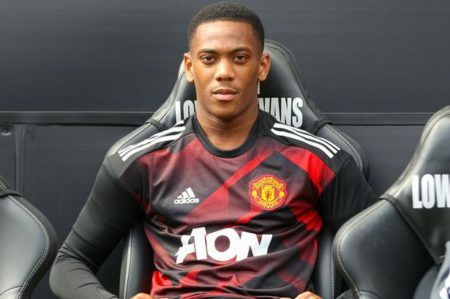 Martial is being courted by Premier League teams, though United are averse to selling him to a rival. Martial was phenomenal at the start of last season, scoring goals, dribbling and creating goals in equal measure. Overall, he averaged 112 minutes per goal or assist in the whole of the campaign. He had 9 goals and 5 assists in 30 league matches, of which only 18 were starts. The arrival of Alexis Sanchez in January limited his playing time on his preferred left attacking midfield position. He should also learn to play on the right wing, and stake a claim for more first team action. He was shunted to the bench and even when Sanchez was off-colour, he was not still used. He had a passing accuracy of about 81.5%, 1. 4 dribbles per game and also had 1.6 shots per game. Martial has just a year left on his deal, though United have a 12-month contract extension clause. United should give him a contract extension and help him get better. It would be a great thing to see him shine at Old Trafford. He joined United in 2015 and has since scored 36 goals in 136 matches. Martial the future compared Mourinho, Perisic and Willian the past. I hope Martial perseveres with United he will be there longer than Mourinho. Mourihno is z stupidest coach in z world.He has killed many players in his coaching life,in Chelsea,Madrid and inter milan (Adriano,Mikel,Ba,Roben,Wesley Shjinider,Vaandervart,Daniel Sturage,De Bruyne,Remeo Lukaku and others…)Martial is z promising and talented players.He will be world star and he is better than Sanchez,Persić and William.Mourihno don’t know how to cultivate the youngsters but he only knows to buy expensive players.Pls get out of united yourself,I love united but I hated Mourihno. Mourinho came to ruin United wih his transfer policy. Why thinking of letting Martial leave and going for aging players? Why trying to sell Martial so cheap and wanting to buy aging players so high? I see the how Jugan Kloop makes his signings and how he sells. Mourinho only goes for those their names are on the high books. Martial is good player, he is also good in(dribbing, skill, passing etc.) i believe martial can be best player or world best player at old trafford like christiano ronaldo made it when he was at man united, so i support don’t sale him, he is young and surpass than william or ivan. Is no brainer for any manager to dissss young players for aging players let keep the faith on martial. This season might work out good for him.